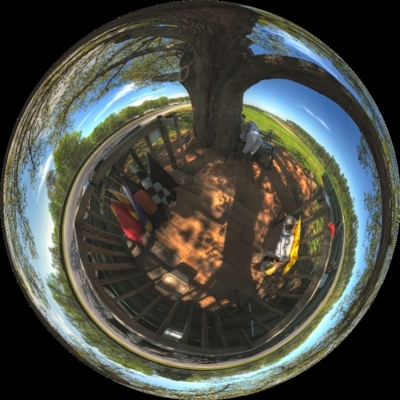 Stuff & Things from Mo's Panoramic viewpoint. Click on images to open them. This past Spring (April/May 2013), I took an amazing trip West to the Grand Canyon, Monument Valley, Colorado National Monument, Lookout Mountain and all the points between on I40 (outbound) & I70 (return trip). The Grand Canyon is Nature’s creation but Monument Valley is God’s work of art. From time to time, I look at the stuff I put here (!!!). I post in spurts (creative lapses?). While I was putting the post up about the visit to the AFA, I was proofing for mistakes and trying to remember how to do this, when I noticed something I hadn’t before. 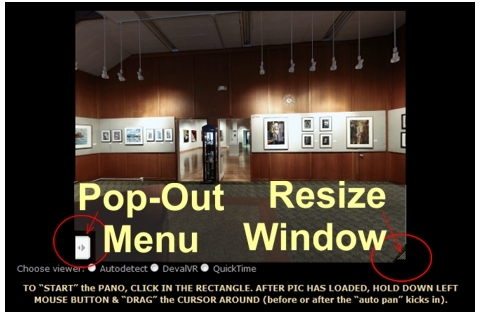 If using “DevalVR” to view the pano, after one clicks on the static, still pic (with the “arrow” in it’s center denoting there’s a link to a panorama there), the panorama scene has 3-4 small diagonal lines in the lower right hand corner. By placing your cursor on these small “arrow” lines, clicking and dragging you can Resize the Window, enlarging the view … neat! Also,there will be a “Pop-Out Menu” tab, in the lower left corner, that when clicked on, will present the user a menu with a few different options. A good friend exhibited some of her watercolor and mixed media works at Lynchburg’s Academy of Fine Arts‘ “Up Front Gallery” the month of November. Karen took time to arrange for me to shoot her exhibit this week and while there introduced me to Ted Batt, the Exhibition Curator of the Academy of Fine Arts (“AFA”). Ted and Karen led me on a tour of the AFA, pointing out the details of it’s ongoing resurrection and restoration. Their website has links to the process, showing the future of the theater and is well worth a look. It’s amazing to see the “internals” of this very historic site. Karen is an educated and very accomplished artist with an abundance of talent, which I am very jealous of. I’m trying to coax her into getting back into teaching, by teaching me(!) the basics of producing the various medias she is fluent in. I envy those possessing artistic talents, it must be very satisfying to produce the works of art they do. For more of Karen’s great work, please visit her website. 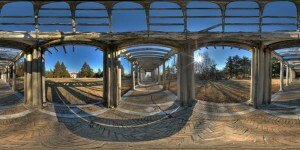 TO “START” the PANO, CLICK IN THE RECTANGLE. AFTER PIC HAS LOADED, HOLD DOWN LEFT MOUSE BUTTON & “DRAG” the CURSOR AROUND (before or after the “auto pan” kicks in). Here’s a pano of the Big Otter Mill, an old saw and grist mill, shot in late March of 2012. This mill was first built and operated by Joseph Hardy, Sr., a veteran of the Revolutionary War who settled here in the late 1700s. In 1785 the county granted him permission to erect a mill at this site which became operational in the 18th century. A fire destroyed this mill building around 1916, in 1917 a flood washed away the mill which was replaced 1920. The mill produced its brand names of Golden Eagle Flour and Pioneer Corn Meal but ceased commercial operation about 1950. Big Otter Mill is situated on the bank of the Big Otter River, a few miles north of the City of Bedford, VA on Route 122 North. A “Big Otter Mill Foundation” is active and it’s mission is to restore the mill for the purpose of historical preservation as a working mill. Tours of the mill are available at special events and by appointment. Please call 1-540-537-4363 for more information. A panorama of the restaurant, Lodge and Sharp Top Mountain of the Peaks of Otter park on the Blue Ridge Parkway in Bedford, VA. I elected to do this after discussions by Bedford residents (past, present and wannabes), on Facebook uncovered plans to close the Lodge & restaurant after breakfast on Nov 25, 2012, due to the National Park Services in-ability to contract with a new lessee. This would be a terrible loss. A more beautiful, serene, laid back setting is hard to find. I have always found my way back to this place when I need a “clearing of my head”. 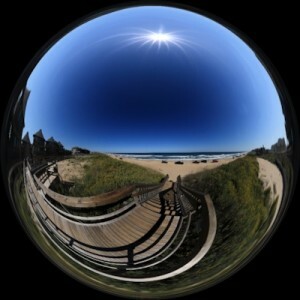 This is a link to a panorama of the Nags Head Pier taken in May 2012. This is a link to a panorama from the bridge from downtown Lynchburg, VA to Percival’s Island. TO “START” the PANO, CLICK “ARROW”. AFTER PIC HAS LOADED, HOLD DOWN LEFT MOUSE BUTTON & “DRAG” the CURSOR AROUND (before or after the “auto pan” kicks in). I found myself on Mill Mountain this past Saturday (3-Mar-12), thought it to be a good candidate for a pano, so I set forth to produce one. I hadn’t made one in a long time so I was slow and methodical in my preparations. My new camera (Canon 5D Mark II), has a “Live Preview” feature, so being lazy, I simply glanced at the back viewer before I shot the sequence. I shot 3 or 4 pano sequences from different places on the overlook. My audience was very intrigued with my apparatus and methods. I wanted to appear to be the professional that all my equipment begged for, therefore I didn’t check my work on-site. I got home, downloaded the pics and …. WTH?????? I didn’t have full frame shots, I had circular shots!!!!! Dummy me took the lens cap off the 15º fish eye, BUT forgot to take off the conical sleeve that it fit onto … The shots I took looked like I was shooting down the barrel of a gun!. I did throw together a few of the images and “worked” on them to come up with a static “flat” pano of downtown Big Lick. This is a link to a panorama of the “homestead” after the Christmas snowfall of 2010 (I put a little bit of myself into this one … hehehe). Alas, there’s only a couple of things I can do about it. 1. Become a racing “Snowbird” and go to Florida. 2. Clean off the driveway each time it snows this year … Hummm, I’ll get back to me on which I decided on. Here is a panorama of where I spent my 2010 birthday. This is Turn 5 at Summit Point Raceway in Summit Point, WVA. Summit Point is ~15 miles east of Winchester, VA. This is the track that I began flagging at in 1984, it is a 2 mile track that is host to the Washington DC Region of the SCCA. This was taken on June 27, 2010, right after lunch, when temps were well into the high 90’s. Caught napping, before the action resumed, were Dan Zane, Josh Cockey (again …) Ray Hall and AFC Dale Ferril. TO “START” the PANO, CLICK IN THE RECTANGLE. AFTER PIC HAS LOADED, HOLD DOWN LEFT MOUSE BUTTON & “DRAG” the CURSOR AROUND or just wait for the auto pan to kick in. Here is a panorama of Poplar Forest Golf Course in Forest, VA.
TO “START” the PANO, CLICK IN THE RECTANGLE BELOW. AFTER PIC HAS LOADED, HOLD DOWN LEFT MOUSE BUTTON & “DRAG” the CURSOR AROUND. The course is in the front yard of Thomas Jefferson’s “country home“. It was taken 7-Feb-2010. The practice green had ~ 8″ of snowy ice on it. This past week (17-Feb), the practice green still had 7” on it and the “guys” were shagging balls off a mat “herding” the ice skating geese! This pano is not too well made, it was shot off one foot and didn’t mesh well. It did give me the opportunity to manually “touch up” a couple of mismatches (now I no longer see them). This is a test of QTVR in WordPress. Ken Conger visited Lynchburg last night and gave another super presentation of his most recent pics taken in Alaska. The presentation is the second I have attended at monthly meetings of BRPAS (Blue Ridge Photographic Arts Society). Ken was in conservation enforcement for over 30 years and has now devoted his time and efforts to his love of photography … and it shows! 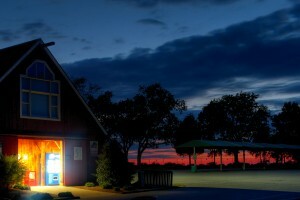 Ken both inspires and embarrasses me by humbly showing off his photos. After the presentation I attended, I told Ken “I hate you!”, just to let him know I was very envious of his talent and body of work. If you EVER have the chance to attend one of Ken’s presentations or see his works framed, up close and personal …. DO IT!!!! 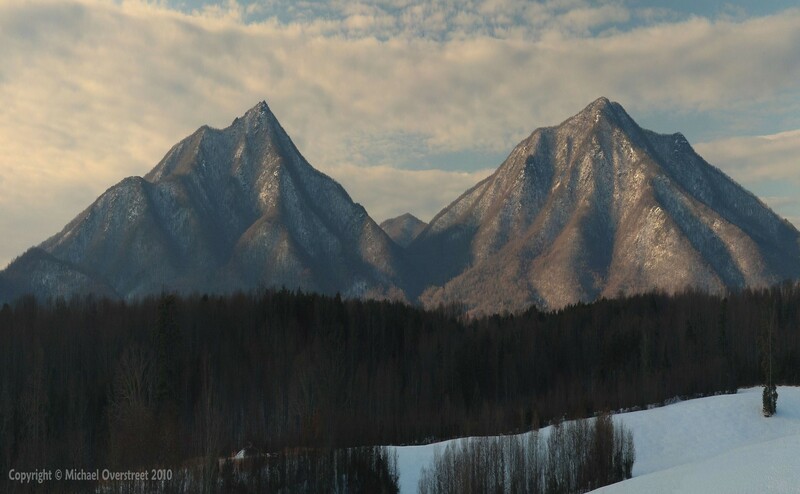 This is a “distortion” of a small panorama of the Blue Ridge Mountains Peaks and FlatTop Mountains. The original shots were taken a couple of days after the “big” 15″ – 18″ snow just before Christmas ’09. Was just playing with the pano and stretched it a bit and kinda liked it! I don’t normally like stuff like this but since I know what the source looked like I deem it “acceptable” (for me anyway). The 2009 SCCA Run-Offs at Rd. America. Thursday 09-24-09, Turns 6, 7 & 8 shot from Driver’s Right, beneath the huge leader board. This is a great viewing location. Cars are prone to end up in the sand traps at Turn 6 (Driver’s right), Turn 7 (Driver’s Left), if they make it thru those turns, Turn 8 has a great wide run-off area that leads into an unforgiving sand trap (Driver’s Right). This complex of turns will definitely get one’s attention. The b each at the Outer Banks Beach Club, the Fall of 2009. The annual fishing tournament began today and the beach was “covered up” with four-wheelers … and a couple of sunbathers. Many blues were being taken on the Nags Head pier tonight after the North wind subsided … and after a great meal on the pier! 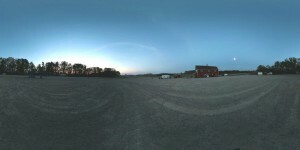 CLICK on the image to view a panorama (360 x 180 degrees) of the beach. Run-Offs 2009 at Rd America T6, 7 & 8 Pano Mirrorball. Turn 6 is at the top of the hill on the far right, Turn 7 is a right hander leading downhill into the left hand Turn 8. CLICK on the image to open a “.mov” pano file of Turns 6 thru 8 at Rd America during the 2009 SCCA Run-Offs. This was shot in the dark, from the rear of my camper. The “Covered Grid” is on the right. Drivers waiting to be released to the track are gridded beneath the “roof” (good in the sun or rain!). Drivers paddock (park their cars & “rigs”) in the area this is shot from and to the right. Turn 17 (the final Turn) is just over the hill and the front straight is to the far right. Roebling Road Raceways Turn 4. Friday of the July 2009 Double National. Nags Head 5-09 Pano Mirrorball. 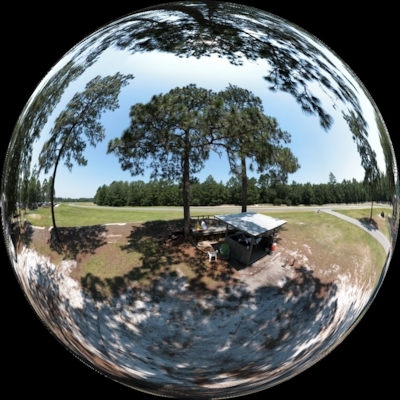 Click on the image to open a “.mov” pano file of the beach at the Outer Banks Beach Club. In the pano are a red bi-plane, two fishing piers, a kite and the moon. This was a beautiful cloudless day! 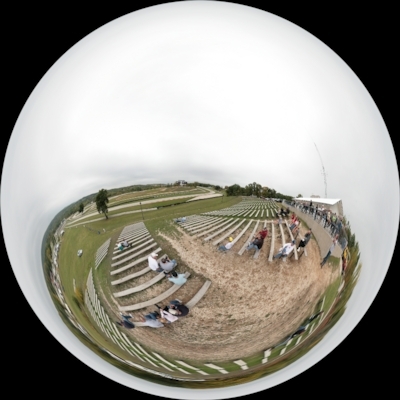 This is a mirrorball image of the Flag Station at Oak Tree (Turn 11) at VIR. 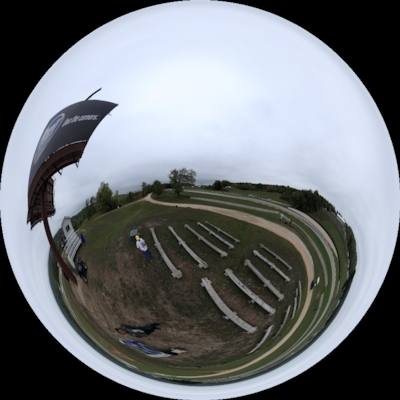 A 360° x 180° panorama of the flag station at Oak Tree (Turn 11) at VIR. The Oak Tree is the “signature image” of VIR. With their back to the front right fender of the cars rounding the turn, the Flagger watches incoming traffic from Turn 10 on the right and outgoing traffic to Turn 12 on the left, past the South Paddock. A great place to watch the racin’. The stands outside the fencing, is a favorite of spectators and many photographers lurk inside the fencing. This pic was taken the weekend of the April 2009 Rolex race. VIR South Paddock Pano. Here’s what the South Paddock looks like on a lonely night. Swannanoa is a huge mansion located on Afton Mountain. I “stumbled” upon it after finding a dirt road that went up (dirt roads are somewhat hard to find these days), it turned out to be the back door into Swannanoa. A beatiful place. I hope to return to spend more time taking additional photos. The Inn at Afton on Afton Mountain is located at the cross roads of Route 250 and I 64. It is the northern end of the Blue Ridge Parkway and the southern end of the Skyline Drive. Waynesboro, VA is to the left (west). Powered by WordPress v 4.8.9. Page in 5.958 seconds.